Did you ever wonder about the origins of the Mu legend? The Mayan "airfields"? Zeus and the panoply of early gods? Where we got our picture of the Devil's appearance, with horns, goat feet, and red color? How about legends of Hell as a hot, smoky, underground place populated with Devil-like creatures? To take on all of this, add super-science marvels such as truly efficient solar power systems, momentum-wave space drives, anti-gravity, and intergalactic, possibly interdimensional travel, in one not-very-long novel, wow! John W. Campbell did it, and made it believable. Spencer: "Good Heaven! The Sun! Do you mean that thing could tap the awful power of the Sun?" Munro: "It's hard to think of all at once. Tapping the mightiest machine — the most inconceivably huge engine in the universe really — for any star would do." Munro has a personal interest in a better drive. He was born on Jupiter, parents voluntarily stranded for 20 years because early chemical rockets could get them down but not back off the surface. He's five feet seven inches tall, and almost five feet in circumference, weighing well over 300 pounds. Immensely strong, and a genius in his field, he is one of Campbell's more interesting characters. At Campbell's usual breakneck speed of a major invention every couple of pages, they are testing the new drive and propelled into another universe by a high-speed collision with an asteroid. Finding themselves in the middle of an interplanetary war, of course they find it necessary to figure out who are the good guys and help them. Their faces were long and narrow, and they had horns, but their eyes and	their noses and their mouths were something like those of humans. They had a	torso and a pair of true hands, but their feet were the feet of goats and their	bodies were hairy. And the strange light had bred something into them that	made them red, for the light was greenish in hue. They were hideous. The last great ruler of this race, a fellow named Tsoo-ahs (He, incidentally, finds the secret of controlled ball lightning. Sound familiar? ), sees that the battle will never end until one side or the other is completely wiped out. After much destruction, only one shipload of people managed to escape, followed, of course by the Teff-Hellani, the baddies. The two races settle separate planets and build up civilizations again, and so the war is on. Enter Spencer, Carlisle, and Munro to save the day. I won't give away any more because it's just too much fun to read. Well, just one little thing... I hope JWC didn't bite off the end of his tongue he was holding firmly in cheek when he made up the Teff-Hellani's temple of war. The temple was named Kakkakill, and the God of War was (drum roll) Kak-ka! Okay, so The Mightiest Machine leans toward space opera. The story is still fun science fiction, and the ideas and inventions are made plausible by Campbell, himself a former MIT student. To combine all of the ideas, science, philosophy, and legend contained in The Mightiest Machine would be impossible for most writers. John W. Campbell makes it seem easy. ... there is another type of error, the consciously made error. 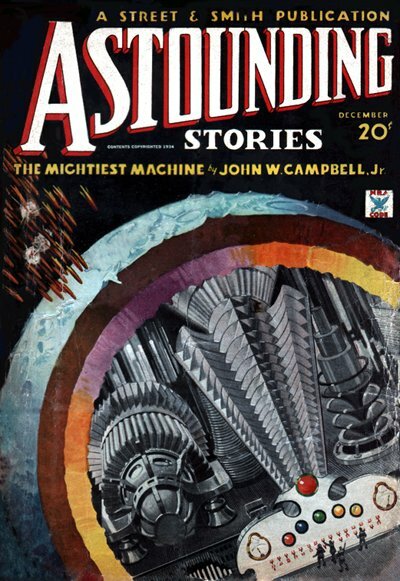 In 1933, I wrote a story, The Mightiest Machine, which appeared during 1934 in Astounding. The hero of that story was supposed to have been the son of colonists who had established themselves on Jupiter. That is, I know now, impossible. But the fact that Jupiter has an atmosphere of methane and ammonia was not known until very late in 1934, and announced in 1935. I'm not dropping Aarn. Munro makes a good character; the rest of the science I introduced in The Mightiest Machine was sound. There will be other points I have to elide, bits of fact that will make the story better [if we forget them]. I'm not trying to explain all science — just interesting bits, illustrated by some interesting application.